Netgear’s Orbi mesh router system is one of our picks for the best wireless routers money can buy, and it’s set to get a lot better, with the company announcing at CES 2019 that it will be releasing a new version of the Orbi RBK50 series with some seriously upgraded features. The inclusion of Wi-Fi 6 support (also known as 802.11ax) will make wireless network speeds even faster, and will better cope with heavy network traffic, with Netgear claiming that it will “address the performance needs of the gigabit internet home”. With so many devices in our homes now connecting to Wi-Fi, this new technology could provide real performance benefits, especially when it comes to streaming 4K video, and other bandwidth-intensive tasks. Netgear is also improving connectivity between the various Orbit units throughout the home to provide an even faster, and more reliable, mesh network. According to Netgear, it's adding 1024 QAM with a 4x4 Wi-Fi 6 backhaul to the new version of Orbi, which will increase the speeds, coverage and capacity of the dedicated link between Orbi satellites and the main Orbi router. By promising gigabit wireless speeds, the new series of Orbi routers could give us Wi-Fi speeds that are comparable to those of some wired networks. 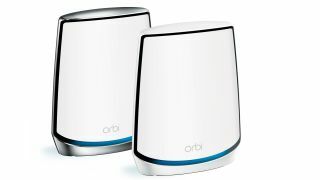 The Wi-Fi 6 version of the Orbi RBK50 will launch in the second half of 2019, and we’ll be sure to get a unit in to test just how much of an improvement this new tech brings.